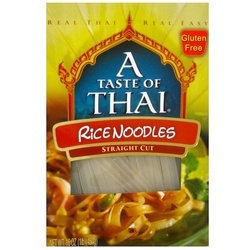 A Taste of Thai Rice Noodles are straight cut like traditional pasta. Don't use them just for Thai dishes; they can be substituted in any recipe calling for wheat pasta. Authentic Thai seasonings, sauces and curry pastes imported from Thailand. All products are now gluten free and most have reduced sodium.